This was another hit-the-ground-running kind of morning. I really wanted to enjoy a sit-down meal in the dining room, but decided that wouldn’t be the best idea. Over the past few days, service there has been pretty slow. If it was a sea day or we didn’t have any plans, that’d be one thing. But given that we were arriving in St. Lucia, it seemed like a better idea to do a grab-and-go breakfast. Just off the coast of St. Lucia. We wound up going to the buffet, but could just as easily have gone to Ocean Plaza. Most mornings, they had a pretty decent spread set up where Taste Bar used to be. Nothing fancy but all the basics… eggs, bacon, cereal, oatmeal. And it never really seemed crowded, likely because most people didn’t even realize it’s an option. St. Lucia is one of the more mountainous islands of the Caribbean and is home to the Pitons, two volcanic spires that have risen from the ocean floor. It’s one of those ports where you really want to make sure you’re out on deck (or on your balcony) when the ship approaches. God took our arrival to the next level by arranging for us to be greeted by a rainbow. This is why you don’t sleep in on port days. Greeted by a rainbow when arriving St. Lucia. Our original plan for the day was to just head to a beach. But while we were having breakfast on the Lido Deck we ran into a friend who said that he and his wife had booked a tour but had decided to sit it out. Having heard good things about Cosol Tours, this seemed sort of like a sign, so we opted to take their tickets. Heading out on our shore excursion. I did, however, have one important question to ask before heading out: How long would the tour last? If you know me, you know I’m not a fan of long excursions. But three hours? That seemed like the perfect length of time for my admittedly limited attention span. 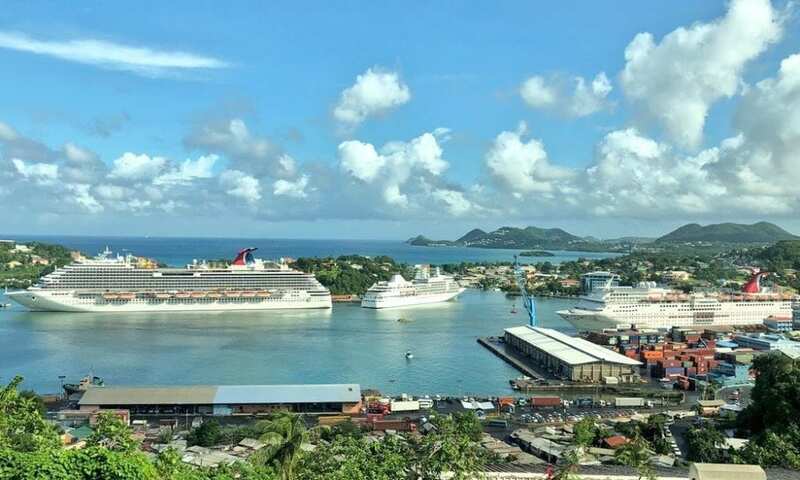 Three ships were docked in St. Lucia today. You’re probably thinking to yourself, “Seriously? All that in 3 hours?” As it turned out, the tour was actually a little over 6 hours long. But it was time (and money) well spent. We really got to explore St. Lucia, and at no point did we ever feel rushed. The highlight of the tour for me was the mud baths. They claim that giving yourself a good coating of the mud will make you look 12 years younger. While I’m pretty sure the mud didn’t work on me, it was still a pretty cool experience. Trying to look 12 years younger after the mud bath. By the time we got back to the ship it was just about time to get ready for our sail away, which was at 5 p.m. As we were pulling out of St. Lucia, I tried something new. Instead of taking pictures from the deck, which is what I normally do, I headed for the top of the waterslide and got some great shots from the higher vantage point. Leaving St. Lucia on Carnival Breeze. Now, don’t assume you’ll be able to do this, when I’ve attempted to get pics from up there in the past, the posted lifeguards have sent me right back down. But it never hurts to try, and this time, the lifeguard at the top of the slide was cool and let me take my time. It probably helped that this was right around the time of the first dinner seating so a lot of families were eating, so the water slides were pretty quiet. The night started with yummy dinner rolls. What better way to celebrate the mud baths having knocked 12 years off my appearance than dinner at one of the best spots on the ship, Fahrenheit 555 Steakhouse. Carnival recently raised the price in the steakhouse from $35 to $38 dollars per person, but if you ask me, that’s still a bargain. Reviewers of the Breeze’s steakhouse haven’t always been kind, usually citing slow service. And in retrospect, that was probably true tonight. But honestly, I was glad to have a little extra digestion time between courses, given how much food we ordered. I started with the classic French Onion Soup. Oh, a little tip: When the server tells you it’s hot, he’s not kidding. Proceed with caution. Piping hot French Onion Soup in the steakhouse. For the main course, I went with the 18 ounce cowboy-cut ribeye. After they take your order, they come around with a cool box of salts so you can decide which you’d like to have your selection seasoned with. I went with the pink Himalayan salt because of its alleged health benefits. Between the salt and the mud bath, I was going to walk off this ship healthy as a teenage marathon runner. These six salt selections were brought out after we ordered. For the side dishes, I went with a baked potato and mac and cheese. The 18 ounce cowboy cut steak. The mac and cheese was amazing! For dessert, I took the healthy route and ordered a fruit cup. But I’m sure you don’t want to see that, so instead I’ll show you what James ordered: the New York style cheesecake. I had a bite, and it was pretty good. Especially compared to the dry cheesecake we’d previously had in the main dining room. The New York style cheesecake in the steakhouse. The comedian tonight was Diane Ford, and she was so popular that we couldn’t even get into the 9:45 show. After the show let out, I spoke to several people who raved about how funny she was. Sorry I missed that, but I’ll keep an eye out for her on future sailings. The MEGA deck party on Lido. The Mega Deck Party was being held on the lido deck at 10:30 p.m., with the pre-party set to begin a half-hour before that. We swung by just after 10 p.m. and the party was more like a dozen people mingling. Things picked up a bit after the always-popular Love & Marriage show got out. But truth be told, this party was never going to be “mega” given that it was a 14-night cruise on which the average pre-mud bath age was around 70. Besides, tomorrow we’re arriving in Grenada, so maybe people crashed early to prepare for whatever adventure they had planned. Reader Question: Are you using credit cards, debit cards or cash on the islands? Enjoying an overpriced drink in St. Lucia. Depending on where we are going, I alternate between my Fun Points credit card (because of the international protection and no transaction fees) and cash. Before we left Port Canaveral, I pulled out some cash and set myself a daily budget of $90, and so far I’ve stayed well within that. For the shore excursions, I’ve paid cash and, if we’ve gone to a bar while on shore, I’ve used my credit card. I know some people are wary about using their credit cards when they travel, but I’ve had great experiences… even when bad things have happened. Earlier this year, my card was compromised while I was in Naples. I called Barclay, the card’s issuer and they immediately canceled the card and began the process of disputing the fraudulent charge with the vendor. By the time I got home from Europe, there was a new card in my mailbox. They even offered to overnight me a replacement card, but as I was on a cruise, that wasn’t going to be possible.